Colorado's Deep Freeze Has Left Many Residents Mopping Up & Filing Water Damage Claims For Frozen Pipes: Insurance Advice For Homeowners & Renters. February 4, 2011 – Old Man Winter's blast of below-zero temperatures this week has left many Coloradans with a big mess—water damage from frozen pipes, now bursting as they thaw out. 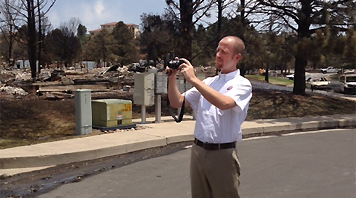 Insurance claims adjusters are busy assessing damage and helping people file claims. Some of the larger insurance carriers have brought in additional adjusters and have declared it an insured catastrophe to deal with the high number of damage claims resulting from this latest round of winter weather—extending from Northern Colorado, through Denver and South down to Colorado Spring and Pueblo. "Even a small amount of water can cause serious damage to your home," says Carole Walker, Executive Director of the Rocky Mountain Insurance Information Association. "The average water damage claim is estimated at $5,500, but can easily cost tens of thousands of dollars with a broken pipe spewing gallons of water onto floors, furniture and personal property." Standard homeowners insurance policies will cover most of the kinds of damage that result from a freeze. For example, you would likely be covered up to your policy limits if house pipes freeze and burst or if ice forms in gutters and causes water to back up under roof shingles and seep into the house. If you do discover damage, make temporary repairs and keep receipts, as those costs may be reimbursed under your claim settlement. Renter's policies will pay for damage to your personal belongings up to the policy limits. The Rocky Mountain Insurance Information Association has this advice for affected residents filing claims for damage. Be prepared to give your agent or insurance representative a description of any damage. Your agent will report the loss immediately to your insurance company or a qualified adjuster. Take photos of the damaged areas. These will help with your claims process and will assist the adjuster in the investigation. Prepare a detailed inventory of all damaged or destroyed personal property. Be sure to make two copies—one for yourself and one for the adjuster. Your list should be as complete as possible, including a description of the items, dates of purchase or approximate age, cost at time of purchase and estimated replacement cost. Make whatever temporary repairs you can to prevent further damage. Save receipts for supplies and materials you purchase. Your company will reimburse you for reasonable expenses in making temporary repairs. Secure a detailed estimate for permanent repairs and clean up to your property and give it to the adjuster. The estimate should contain the proposed repairs, repair costs and replacement prices. Serious losses will be given priority. If your home has been destroyed or seriously damaged, your agent will do everything possible to assure that you are given priority. Keep your home warm. The temperature in the home should be at least 65 degrees to prevent the pipes from freezing. Keep cupboard doors open below sinks. If it snows or freezes, keep all lower cupboards open since most plumbing runs underneath cupboards to allow warm air to circulate. Turn on hot and cold faucets enough to let them drip slowly. Keeping water moving within pipes will prevent freezing. Keep garage doors closed. The door inside the garage leading to the house is probably not well-insulated as an exterior door. Know the location of the main water shut off valve in your home. A damaged hose or a burst pipe can send water racing into your home. By knowing where this valve is located and how to shut off the main water supply, you can save yourself time and money. Check pipes. Look closely for cracks and leaks and have the pipes repaired immediately.